A bi-color ragdoll cat has lots of white on his legs, face and chest. There are a few things all ragdoll cats have in common: big blue eyes, luxurious fur and markings on their ears, tails and eyes. Take a closer look though, and you'll notice that there are several different types of ragdolls, each with their own coat pattern. A mitted ragdoll cat looks like she has little white mittens on her front paws. 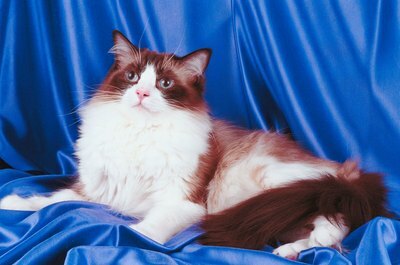 This is the classic ragdoll look and some breeders and enthusiasts are convinced that this is the only "real" type of ragdoll. Besides the mittens, a mitted ragdoll will have white stockings on her back feet, a white spot on her chin that looks like she got into a bowl of milk, and a white stripe on her belly. Most mitted ragdolls also have a white blaze or strip of white on their face. Solid point ragdolls have the same elegant markings as Siamese cats, but on a fluffy ragdoll physique. The points of color are on the ears, feet and tail, and sometimes a little of the color shows up on the body. The rest of the ragdoll should be ivory, cream or soft white. A bicolor ragdoll is easy to mix up with a mitted ragdoll. The quickest way to tell the difference is that a bicolor will have feet that are completely white instead of defined mittens and stockings. A bicolor usually has more color on her back and body, and the fluffy hair on her chest is white. It sounds exotic, but a lynx ragdoll is really the same as a solid point, but with tabby cat markings on the points. The tabby stripes usually show up as a letter "W" on the cat's forehead, giving him a bit of a worried look. Lynx ragdolls usually also have faint stripes on their legs and tails. A tortie is the ragdoll's version of a calico cat. Since the whole body isn't marked, the colors show up on the ears, legs and tail. Tortie colors are usually some form of red and black, although they might be creamy red and light gray, or look more like chocolate and orange. Most official clubs divide ragdolls up by their coat patterns, but it can get a little convoluted since some ragdolls have a combination of patterns. For example, it's possible to have a bicolor lynx, a ragdoll with white feet and chest and tabby cat points, or a mitted tortie with white mittens as well as red and black coloring. Just about any combination of coat patterns is possible, which makes it really hard to figure out the type of some ragdolls. Why Are a Kitten's Eyes Closed for a Week? How Long Do Tabby Cats Live?